1. Started from the bottom. Daenerys Targaryen is an example that success isn’t either easy or instant. She wants an army and she really focus on that. Despite the death of her husband, she doesn’t stop there or even cried for help. There are many unfortunate events coming to her, but she stays strong. Being the last Targaryen (not really) and the Mother of Dragons isn’t easy for her. And now, Daenerys is so close to the throne with thousands armies on her back, plus two dragons. 2. It’s okay to be a slow learner. 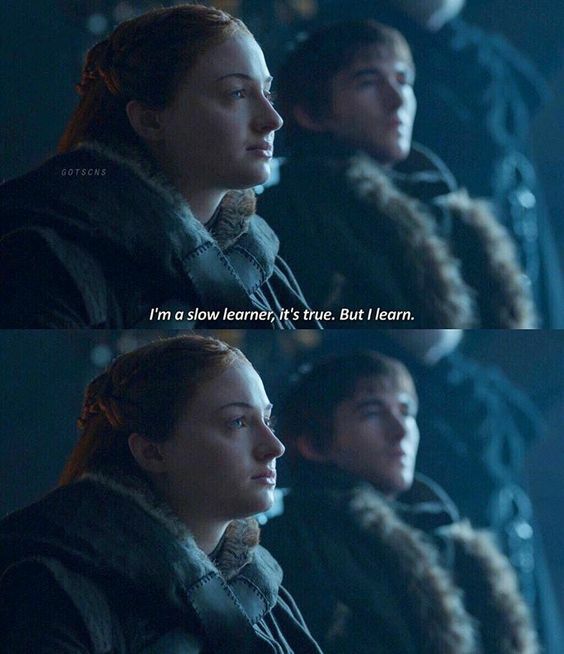 Sansa Stark teaches us that is okay if you’re a slow learner, but you’re learning. There are many moments when I really wants to shake Sansa’s brain, to make her realize that she’s so innocent and naive during few earlier seasons. Eventually, she steps her game up during season six and seven. She’s a badass woman and don’t mess up with her or you’ll end up like Littlefinger. 3. A girl can be whoever she wants. Before Arya Stark gone dark (I mean before she becomes faceless man), she’s just a tomboy with a needle and a full desire to revenge all the people who hurt her family. On the earlier season, her dad basically told her that a girl shouldn’t be with weapons, or just be like her girly sister, Sansa Stark. But she managed to get a little sword and a teacher. And now, she has the ability to become anybody. 4. Age is just a number. Lady of Bear Island, Lyanna Mormont, is one of the most intimidating female characters in Game of Thrones. Even she’s just a twelve years old child, she has the heart & brain like a real lady! She’s brave to speak up in a room full of adults. Well, it’s not easy to be heard when you’re just a kid. 5. Strong as Brienne of Tarth. Most ladies in the Game of Thrones world, are described as feminine characters. Long haired, beautiful gowns, pretty face. Unlike this Lady Brienne of Tarth, she’s strong as hell. She’s the only woman who can defeat The Hound. She’s also loyal and keeps her jobs as her top priority. No matter how hard the journey would be, she will never disappoint anyone who gives her job. 6. Play it smooth like Margaery Tyrell. We know she’s dead now. As you remember her life (before Cersei blew everything in the Great Sept of Baelor), she was kept in that horrible dungeon because of her sin–trying to cover up her brother’s sexual identity. She is actually playing game with so she can survive. She pretends like she’s brainwashed, but she’s actually preparing something not until Cersei killed them all. We have to admit it, even though Cersei is the main villain, but she’s a family-oriented person. Not matter how messy your family is, she always put family on top priority. But, Cersei isn’t a great example for relationship stuff. Family always comes first, but that doesn’t mean you have to “love” your brother as well. What’s your favorite female characters from Game of Thrones? Let us know!